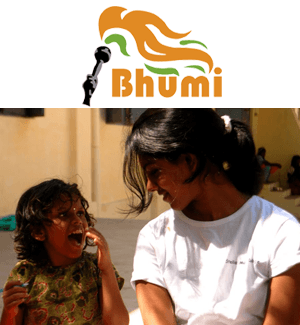 Bhumi is one of India’s largest independent youth volunteer non-profit organisations. Our volunteers work amongst orphaned and underprivileged children in Tamil Nadu, Karnataka, Maharashtra, Telangana, Rajasthan, New Delhi and other parts of the country. Around 7 million children in India don’t attend school with the majority born into disadvantaged families. With a humble beginning of 6 volunteers in 2006, Bhumi has today grown to providing supplementary education and life skills and mentoring to over 18,000 children across 10 cities. All of Bhumi’s volunteers are working professionals under the age of 30 and go through mandatory orientation. They teach and mentor children living in slums, orphanages, and village community centres at close proximity to their residences. Aside from teaching various subjects, Bhumi also aims to improve children’s confidence with newly acquired communication skills. Our annual festival, Nakshatra, where hundreds of children from different orphanages enjoy learning and participating in various competitions, has been a runaway success, providing children from disadvantaged backgrounds with an opportunity to improve their self-confidence and develop their talents and hobbies. In addition to being a part of one of these programmes, our volunteers also handle day-to-day administrative operations and other specialised verticals like Human Resources, operations, public relations, syllabus development, training etc.